Hello chocolaty goodness! These raw brownies will satisfy any chocolate craving. 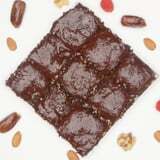 Sweetened with dates and honey, these brownies are wheat-, egg-, and dairy-free, but still so tasty. Watch this video to see how easy they are to make. You eat healthy 80 percent of the time, and the other 20 percent of the time? Chocolate. If this sounds familiar, these quotes will make you feel better.